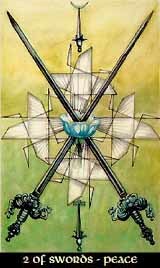 The Two of Swords are representing the beginning of analysis, putting the pure, undirected ideas of the Ace underneath separation and differentiation, to bring them towards a specific form and end. Chokmah is creation and manifestation, showing the element in its best light, and so the mind gets its best chance to indicate its powers without showing its shadows. For the Swords, this means peace, since the mind is on its finest level when just administering its potentials.